If you’re considering a move, be it a business move or a residential move, then check out what we have to offer at Moving Connections. Moving Connections is a full service professional moving company based in Northern Utah. We are federally licensed, bonded, and insured. We provide a wide range of services, including labor only service, staging services, handyman services, and storage services with both climate controlled as well as non-climate controlled storage areas. If Moving Connections is moving you to Farmington it's a perfect time to begin to utilize the many resources and bounties of Farmington. For example click on the picture to the left to go the Moving Connections 'Support - Advice - Assistance' page and discover Farmington for the first time. Once you are on the 'Support - Advice - Assistance' page go ahead and open the .pdf link found there and tape the list of emergency and useful phone numbers on your refrigerator. 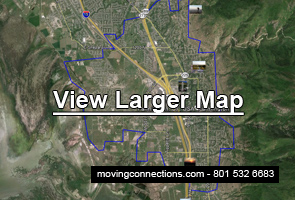 Moving Connections has gone to great pains to find those links and connections to integrate you quickly into Farmington life. When you hire the services of a moving company, you want to know that they’re professionals with experience in the moving business. That’s why we at Moving Connections have the highest standards for our hiring policies: we won’t take anyone who hasn’t had experience in the moving business. Moving Connections also is a federally licensed moving company, bonded, insured, and with its own federal Motor Carrier Number. Moving Connections also provides support services, such as home staging, handyman services, and storage rental. In addition, we provide crating services and shipping services for fragile or special items that you might want shipped separately through one of the major “small package” shipping companies, or palletized shipments via our 2-day air express contractor at very reasonable rates. Facing some hard economic times? Need a moving service that is professional, yet sensitive to your budget? Welcome to Moving Connections’ “Labor Only Move”. With the “Labor Only Move”, you provide your own truck (usually a rental) and driver (usually you or a relative) which saves you lots of money. Moving Connections still provides the highly skilled moving crew who will pack, wrap, and load your belongings on your truck according to the highest industry standards. Then you drive your truck to your new location, where you can unload it yourself. This reduces your costs by a huge amount since we at Moving Connections charge by the hour, and that includes driving time. So the more you do, the more you save. Just think of it as “sweat equity” as applied to the moving business. Are you planning to move a small office to another office in the same building? Or are you planning a total corporate relocation to another city? Maybe something in between those two types of moves? Whatever your needs are for your office move, Moving Connections is the answer. Moving Connections has performed the smallest office moves as well as multi-truck corporate transfers and is comfortable with all of them. Moving Connections also coordinates with business decision makers to keep you up and running as much as possible during the transition. And that means more money in your pocket.